Leica microscopes are industry leaders when it comes to health care and semiconductor equipment. Based in Wetzlar, Germany, the company now has eleven factories spanning the globe. Today Leica is meeting the needs of users in a variety of fields. In fact, their technology re-measured Mount Everest’s summit, and showed that it was actually two meters less than the previous reading! These microscopes got their start in 1849, when Carl Kellner founded his Optical Institute. Kellner’s first achievements were improving the image quality in field glasses and telescopes. His work was a big success, and encouraged Kellner to proceed to making a new type of microscope. Kellner’s design for the beginning Leica microscopes was based on mathematical principles that he learned through his optical work, yielding units that had outstanding image quality. The demand for early models was greater than Kellner could produce, and for the first five years the company was only able to make 130 microscopes. Kellner eventually succumbed to tuberculosis in 1855. His widow married Friedrich Bethle, who managed to keep the Optical Institution going. At that point Bethle’s health was poor, and the company’s future was unsteady. When Ernst Leitz joined the company in 1864, he brought along his own skills. He had studied the art of manufacturing laboratory equipment. He eventually became a partner in the company when Bethle died in 1869. Leitz didn’t just change the company's name when he took over. He also changed the entire way the early microscopes were manufactured. Despite the Franco-Prussian War, Leitz kept the company going with his ideals for efficiency and organization. The company grew over the following years, but the 1920’s brought big changes. Leitz’s son took over the when his father passed away, and launched the first of the Leica microscope cameras. The camera could capture microscopic images that had to be hand drawn in previous decades. This was the first 35mm camera, but World War I prevented the camera from becoming available in mainstream markets until 1925. This step would eventually lead to the marriage of photography and microscopy that Leica microscopes are known for. The following years were filled with successes, financial troubles, merges, and company reorganization. The company eventually split in 1977 into Leica Microsystems and Leica Geosystems. Leica microscope cameras - These models are renowned for their speed and picture quality (right). They have short reaction times, high resolution, and clear contrast. They can capture live images quickly and accurately. Leica digital microscopes - Digital units are often found in R&D and quality control situations, as they merge high quality optics with digital technology. They are well suited for non-destructive inspections, especially in hard to reach places. Leica stereomicroscopes - These types, which produce a 3D image, are seen in industry, research, laboratories, and even educational institutions. They're also designed with ergonomics in mind, keeping productivity up because users are just more comfortable. Another nice feature is that they can be customized to meet the needs of the buyer. 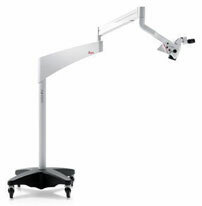 Leica surgical microscopes - These microscopes are geared toward the needs of microsurgery. The units are compact but still deliver clear, sharp images while keeping the ability to maneuver (right). These microscopes are often found in neurosurgery, ophthalmology, reconstructive plastic surgery, dentistry, and gynecology. Leica confocal microscopes - Confocal models produce precise three-dimensional pictures through optical imaging. Found primarily in biomedical research, the units work great for examining subcellular structures and dynamic processes. 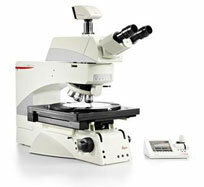 Leica light microscopes - These classic units provide image quality, fast results, and cost efficiency. Whether meant for routine laboratory work or research of dynamic living cells, it can be modified to do the job. Leica virtual microscopes - Virtual microscopes are the latest step in modern laboratories (right). They can capture digital images of specimens, and then networking environments can share the images throughout the system. Whether the image goes across the room or around the world, virtual microscopes can open the door for discussion and comparison. Leica microscopes started small with the simple idea of improving the image that users see. Through the years, the company has grown into an industry leader in the medical and industrial fields. Although modern day Leica models are a far cry from their early predecessors, more than ever they are bringing the microscopic world into focus.